I am researching a relative who disappears from conventional genealogical records. He married and fathered children regularly until his wife died but does not appear in census records with his family nor in city directories. Family lore says that he was a seaman working ships traveling between Philadelphia and Houston in the 1860-1880 period. How do I research the merchant marine? What online record sources are there of seamen? What offline sources do I check, for instance, the National Archives or LDS microfilm? If, as the family assumes, he died at sea, how do I document that? The specifics are Francis McCloskey born 1840-ish in Ireland immigrated to Philadelphia, date unknown married Ellen Lafferty in 1863 seven children were born between 1864 and 1873; four died as infants, three were living when the wife died in a fire in 1873. Of the three living children, one was adopted by a relative and two were put in an orphan home. Where was the father when the mother died and why didn't he take care of the children? When did he die and where? I learned from my own research of my seaman/mariner ancestor Charles J. Wagner of Boston, MA that not all Seaman's Protection records, specifically for the 1880's and 1890's, survived, so for the two of us this isn't a good source of data. mine also is difficult to trace through records. In my pursuit of my ancestor, I got his ship's records from Mystic Seaport, which has a shipping museum that is very happy to send what it has on such things as master, tonage, type of ship, etc. I also contacted the National Archives who sent me Charles' medical records from the Marine Hospital in Chelsea, MA and his pay records from the ships we knew he'd worked on. It took me 3-4 years of poking around to find where the Marine Hospital moved 1) itself, and 2) it's cemetery, and then when I asked for a check of their records, Charles isn't listed among the burials, but yours may be. I wrote Massachusett's state archives for vital records, where I found his son's birth record but not Charles' death record, and NEHGS sent me his marriage record but also couldn't find his death record. We cannot find where he died, though we have a date (3 Aug 1894) whether accurate or not only time and successful research will tell. I've checked out FHL microfilms for various data, and Ancestry.com, finally finding Charles' immigration just last summer. and I've poked in every port I know he was in, to little avail, but no stone left unturned. And Lloyd's shipping records since he supposedly was an English subject before coming to America (though his immigration has him coming from Germany, and all of the records we do have for him claim he was either from Russia or Poland) so these are some possible directions to look into for seamen/mariner's in your tree -- state and national archives, Misty Seaport, every port you can find record of. There are also societies for these men. Unfortunately the records for those societies are in document boxes, gathering dust in most places, and you have to go there and personally search the boxes yourself. Since Charles' wife moved her family across the states eventually settling in Oakland, California, no-one is remotely close to Boston or able to travel there now. Google the area that was your ancestor's home port and then try different terms that fit-seamen, mariner, ships, etc. Sometimes you stumble across some intriguing information. If you have not done so already, you could search for Seamen's Protection Certificates. This blog posting http://blogs.archives.gov/online-public-access/?p=643 from the National Archives describes these certificates, which were used to verify a seaman's nationality. I tried the link listed in the second paragraph, but it seems to hang for me at the moment. Perhaps the servers are down or busy. The “Proofs of Citizenship Used to Apply for Seamen’s Protection Certificates for the Port of Philadelphia, 1792-1861″ ARC (Archival Research Catalog) ID 563421 seems to fit what you're looking for, assuming "family lore" has some basis in fact. As well as an online collection of Seamen's Protection Certificates, Mystic Seaport Museum's website has research guides here: Seamen's Protection Certificate Register Database (via Wayback Machine) and a database search: Registers of Seamen’s Protection Certificates. The National Maritime Digital Library might be useful to get more background information. Also check Cyndi's List for the category: Occupations: Fishermen & Mariners. The book My Ancestor was a Merchant Seaman (Second edition 2002) may be helpful. 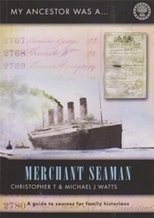 My Ancestor was a Merchant Seaman by Christopher and Michael Watts. The new and heavily revised edition is some two thirds bigger than the first edition and is sure to become one of the bibles for family historians wanting to research ancient mariners. Packed full of places to search and the records that can be found in such record offices and archives, full listings of the same, their class and piece numbers, what to look for and where to find little known records. Available from the Society of Genealogists in the UK. I have similar issues with a whole extended family of mariners. One place I found helpful, although tiresome to read (such tiny print!) is in the port's local newspaper archives. Mystic Seaport has indexes to some, which are helpful, as does the Sturgis Library on Cape Cod. Also, the New York papers (and probably, Philadelphia, since it was a large port) have maritime news and a column announcing comings and goings which tend to be brief, but have given me a hint or information on occasion. I have discovered that a number of my ancestors received their protection certificates from the port they were shipping Into, not the one they shipped Out of so you might have to look in various ports Seaman's Protection Certificate books. You might try the New England Ports (especially of Newport, RI, Plymouth, MA, Providence, RI and ports of Cape Cod) which frequently delivered cargoes to and from Philadelphia. I also had luck researching Civil War maritime records and newspapers. I found mention of two of my mariners who were in Libby Prison and Andersonville. Many of the mariners were delivering supplies to the government in support of the soldiers (including hay for the horses.) I found one record by going to Congressional Records to read claims made by owners whose cargoes or ships were captured by "the other side" when there was an official contract for delivery with the government. Some members of the merchant marines were officially in the Navy, so check those records. Many towns are getting the records digitized and online and many have historians who are helpful. I found one ancestor by contacting the local National Guard when I couldn't find him in Army WWI records; the Guard had a very helpful historian who discovered my ancestor had been in a RI National Guard Calvary unit that was sent to fight Pancho Villa in California and that afterwards, the Calvary Unit was sent to Europe to fight in WW1. He even found pictures of him on his horse with others of the Calvary unit. Be as creative in your thinking as you can and don't rule out anything! Many times churches have records of parishioners volunteering; did his wife attend? And often, if you can find the handwritten online digitized town records, the clerk may have made an aside notation. The custom house at the port will have official records of comings and going of ships; some list crew names, some not. I found the custom house records for RI in a repository in the RI Historical Society- they were not in the state government records. Also, for some inexplicable reason, I have found some mariner records for cities on the East Coast in repositories in California...don't remember which, but they were part of a local collection on micro. There were also local census done of those who were mariners in preparation for the Civil War - mine read "at sea" but other names had more information. The upside to having to look everywhere is that you get quite a history lesson - which sticks with you - unlike those dates we had to memorize in junior and high school history class! Not the answer you're looking for? Browse other questions tagged united-states 19th-century ireland locating-records family-legend or ask your own question.